Not all handguns are created equal. Some are too big and bulky. Others are too small and clumsy to operate. And then…there's the Kahr CW45. It fits just-right. Handles like a dream. And it's a straight-shooter, right out of the box. At just 1" wide, it's one of the slimmest, most compact .45 ACP pistols on the market, offering the heavy-hitting power of the .45 ACP cartridge in an easily concealable platform. And…it's affordably priced. All of which make the Kahr CW45 an excellent choice for personal defense and concealed carry. 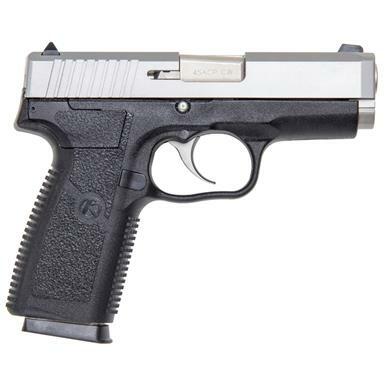 Kahr CW45, Semi-Automatic, .45 ACP, 3.64 Barrel, 6+1 Rounds is rated 5.0 out of 5 by 23. Rated 5 out of 5 by Ever ready ccw from Best, most accurate ccw 45 I ever owned! Affordable, well balanced, fits my small grip, good groupings right from the box, best shooting 45 acp ccw ever. Rated 5 out of 5 by Glenn N Fla from Great Shooter! Worked Great, right out of the box! NO problems! Grab one! This is a deal! Rated 5 out of 5 by hank from this is a great gun ,great price. I was hitting 2 inch groups right out of the box.no problem with recoil, bought a second magazine, if your on the fence buy it! Rated 5 out of 5 by Cujo from Excellent weapon, priced right, but does not like steel Russian rounds Took it out to the range and shot off 150 rounds the first time after receiving it. My conclusion is that you will have problems if you use Russian (Wolf or Tulamo) steel casing rounds. I had real bad FTF (failure to feed) and/or FTE (failure to extract) but didn't have any problems when I used either brass reloads or brass factory loads. Also, the magazine that came with this weapon did not seat well when you insert it unless you slap it in very hard and sometimes several times so I went and stopped using it but instead I had extra magazines from my Citadel 3.5" 1911 7-round magazines made by ACT that fit and went in well. My more expensive 7-round, stainless steel Chip McCormick magazines will not even stay in at all. So if you want extra mags for this, you can purchase a 7-round 1911 magazines made for Citadel 3.5" compact or Rock Island Armory made by ACT. Rated 5 out of 5 by Michael from My CCW I got this because I am a .45 cal. person and was looking for a CCW. I love the 1911, and have a bunch of 1911 mags and they fit well in this weapon, no problem. The Kahr likes brass casings and ball ammo, works well with them. Easy to shoot and accurate, trigger squeeze is long like a revolver, but you know when it will go bang after one mag. Have shot over 500 rounds through and I can shoot 2 inch groups at 7 yards and all in a pie plate at 20 yards. Would recommend to anyone who likes the 1911 and the .45 cal. ammo who is looking for a CCW. 1911 mags. are cheap and easy to find. I paid $259 two years ago for it and was the best purchase I ever made.